Vetroelektrane Balkana d.o.o. secured a credit line worth EUR 215 million for its Čibuk 1 wind power plant, most of which is planned to be built in the Kovin municipality, less than fifty kilometres northeast of the centre of Belgrade. The facility of General Electric Co.’s 57 turbines in the area of villages of Mramorak and Dolovo will be financed by the European Bank for Reconstruction and Development and the International Finance Corporation, which is a member of the World Bank Group. The firm also known as Wind Energy Balkan Group (WEBG d.o.o.) is controlled by Masdar, or Abu Dhabi Future Energy Co. PJSC. The contract signed on October 16 for the wind farm spaning more than 36 square kilometres will enable a launch by the end of next year, investors said. Vetroelektrane says the project is a strategic partnership with Continental Wind Partners LLC’s subsidiary Continental Wind Serbia d.o.o. Cibuk Wind Holding d.o.o., which still owns 40%, was founded by CWP, based in the United States. The American company established the firm in 2007 for the endeavour, and later agreed to eventually let partners from the United Arab Emirates acquire the whole business. The design of the turbines puts columns at 110 metres, while blades will be sixty metres long. 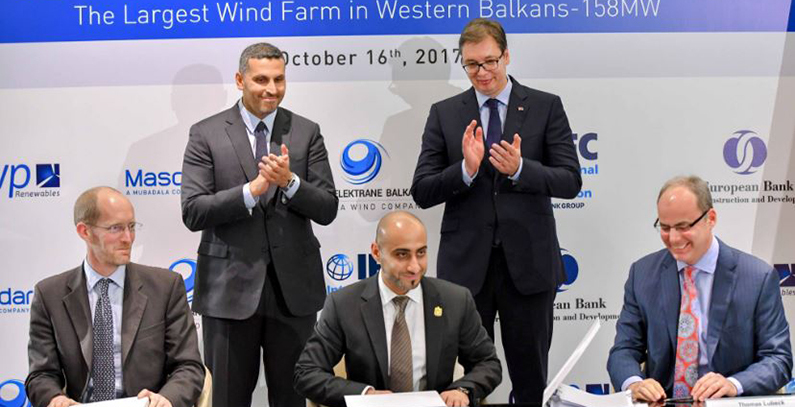 At 158.4 MW, it is set to become the largest wind farm in the Western Balkans, and Serbia’s minister of energy Aleksandar Antić said at the contract signing that it is the biggest single private investment in the country. Estimated annual capacity is 457 GWh. Serbia has an obligation to boost power output from renewable sources to 27% of total consumption by 2020. Antić claimed the 100 MW milestone in generation capacity has been reached. IFC said its EUR 107.7 million financing package comprises a direct EUR 52.7 million senior loan, EUR 36.7 million provided through its Managed Co-Lending Portfolio Program and a EUR 18.3 million B loan under a syndication umbrella. EBRD is providing a EUR 107.7 million syndicated loan under an A/B loan structure, the World Bank Group’s member added and revealed it sees the facility completed by early 2019.